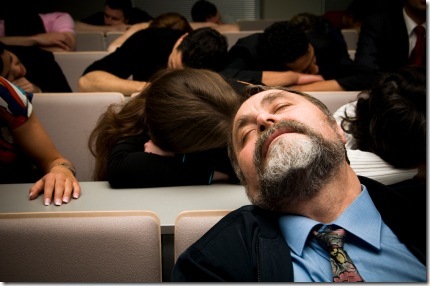 It is easy to create boring, unimaginative and ineffective presentations. Just do a quick Google search and you will find a plethora of advice, resources and great blog posts on improving your presentation skills. In this post I wanted to collect a few of my favorite resources in one place for both myself and others to reference. As you will quickly see, Michael Hyatts is one of my favorite bloggers on presentation tips, (and other topics like leadership). Check out his post on How Not to Use Powerpoint. Maybe not everyone will agree with all of Seth Godin’s whitepaper conclusions called “Really Bad Power Point” but it’s a great read to get you thinking about your presentations. Michael Hyatt is a raving Mac fan and his post My Current Presentation Tools focuses on Mac tools. It’s an interesting post for non-Mac users too, as it shows how professional, effective and creative presentations involve more that just a few bullets in a slideshow tool. Check out Prezi for very neat non-linear presentation tool with a definite wow factor. Make sure you check out some of the sample presentations. Another great post by Michael Hyatt is My Favorite Presentation Resources. It contains some of the same resources in this post and many more on everything related to presenting. Make sure you check out the Presentation Zen web site he and many others on this topic refer to. Don’t forget about the site http://www.slideshare.net/ a free web site that allows you to share MS Powerpoint, MS Word and Adobe PDF documents with geographically dispersed meeting attendees. I am a great fan of Microsoft Visio for creating certain graphical elements to include in presentations. It’s not the greatest tool, but I have become adept with it and it is a standard tool available on most business laptops. Tools like The Brain and Tinderbox are other interesting tools for non-linear thought organization. They can be used for presentation but are not as snazzy as Prezi and are not as focused on presentation as they are for organization and documentation. These are more powerful and creative variations and expand on the more traditional Mindmapping tools like FreeMind, MindJet and Buzan’s own iMindMap. If you really want to go off the deep end on visual thinking, design thinking, the brain, etc…, check out a few of the selections on Dave Gray’s Reading list. Grab some of these new resources and get going on your next more engaging, more creative, and more effective presentation. To get your creative juices flowing on out of the box thinking when you present, check out Roy Disney’s Org Chart. Do you have any great resources that are not listed or reference? Please share them in a comment.